Observation - Iris Sawfly larvae - UK and Ireland. Description: Numerous Iris Sawfly larvae on the leaves of Yellow Iris (Yellow Flag). Spotted at several locations; 10 to 30 mm in length. 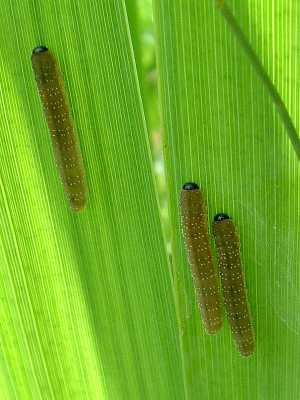 Numerous Iris Sawfly larvae on the leaves of Yellow Iris (Yellow Flag). Spotted at several locations; 10 to 30 mm in length.